It's always story time at A Little Fable, where we specialize in bedding and accessories for your child's room. Take a stroll with Happy Caterpillar, whose bright smile beckons from our diaper bag. Set slumberous sail on the ocean blue with our fleece nap-time blanket. You'll find a variety of themes and colors to delight the eyes and tickle the imagination. Every one of our quilts, blankets, pillows, shaped cushions, storage products, sleeping bags, and other accessories is made with all natural fabrics that feel soft against your child's skin. A Little Fable is a children's garment and home furnishings company where every product tells a story—from flying fairies to forestland fun, from trundling turtles to balancing ballerinas. At A Little Fable, all our products are meticulously designed and beautifully crafted from natural fibres which are gentle on your child's skin. Our colorful themes make both kids and grownups smile, and parents will find our products useful and durable. 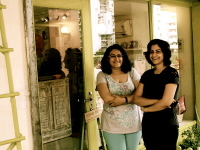 A Little Fable was launched in October 2013 by sisters Radhika and Smita, both graduates of NIFT. With over fifteen years of experience designing and exporting products for the international market, they have catered to well known brands including Gap, Tommy Hilfiger, and Zara Kids, Crate and Barrel, Pottery Barn and others. Now, with A Little Fable, the sisters apply their experience to provide options of international quality to the domestic Indian market. A Little Fable brand is owned by parent company Colorare. We ship in 3-5 days of order confirmation. Delivery will be done by reputed couriers only.